Electric knives make cutting meat easy, slicing through even the toughest meat with perfection. Whether you are wanting to carve a large turkey for the family at thanksgiving or a joint of roast beef, you can tuck into your meal quicker with an electric carving knife. Having a decent electric carving knife is important as you don’t want it to shred the meat or take ages to get the food from your cooking space to the table. If you also want to have a read through some meat carving tips just click the link. 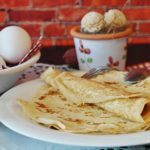 We have put together a guide of useful and important features you should be looking out for when buying your own electric carving knife for your kitchen. If you are just interested in a stylish yet powerful electric carving knife that gives fantastic results when slicing large cuts of meat and bread loaves. We highly recommend Amazon’s best selling electric carving knife at the time of writing. It’s listed below in our top 5 picks but if you would like to quickly check it out before reading the rest of this page please click the link to it here. 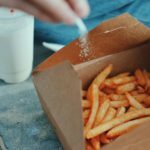 In this section we will go over some of the most important features to look out for when purchasing your own electric carving knife for your kitchen. The reason to purchase an electric carving knife is that it’s very useful if you eat a lot of meat regularly. This small handy appliance is a great addition to any meat lovers kitchen. 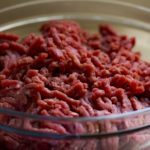 However if you don’t eat fresh meat often that doesn’t require cutting or slicing it’s probably not worth the investment. The only other type of food an electric carving knife is really good for is for cutting bread, but you will usually have to use a separate blade for best results. Having decent blade quality is the most important thing to have when using an electric carving knife as you don’t want the knife to shred the meat or the motor to cut out constantly soon as you hit a small bone. If you are wanting to just cut meat all electric carving knives will be suitable for the task. However if you want to slice bread it’s a lot better to use a separate blade or you risk blunting your meat carving knife needlessly. Having a good quality handle is important as a lot of models tend to vibrate out of control and makes the electric carving knife very uncomfortable to hold. Keep an eye out for any handles that state they are ergonomic and provide comfort while in use while also providing a better grip. There are both advantages and disadvantages to using a corded or cordless electric carving knife but both seem to balance each other out. It all comes down to your own preference really. 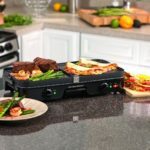 Cordless provides more flexibility while maneuvering around and slicing delicate meat and there is no cord to get in the way. Although this may also give a slightly less powerful cutting action. 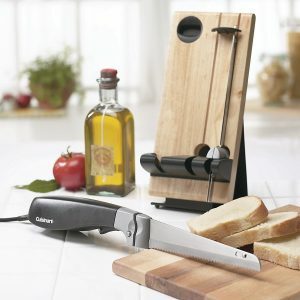 Corded electric knives give a constant powerful slicing motion that doesn’t tend to cut out like a cordless appliance. Great for cutting very large joints of beef or a turkey for example, just watch out the cord doesn’t get in the way! The Cuisinart electric carving knife is a great addition to any kitchen. 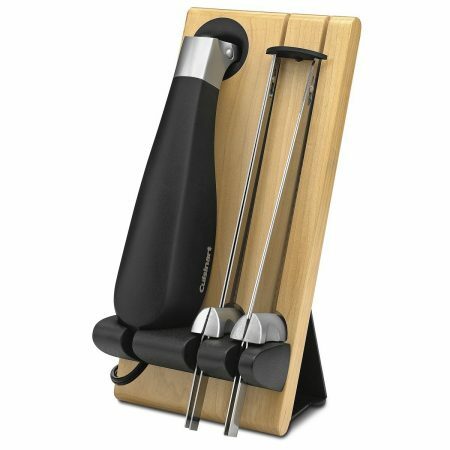 With it’s modern design and compact storage stand it will look great on your kitchen counter top. This electric knife includes 2 full size blades, one for bread and one for meat carving. The electric cord is 4 foot long for maximum flexibility while carving. It has high quality steel blades with a powerful motor to slice through your cooked meat with ease. While it is very efficient at cutting bread loaves and meat, it is quite noisy when in use. Overall we highly recommend this electric carving knife as it has a lot of useful features, and it’s a stylish kitchen tool that will last for years. 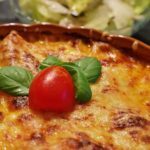 If you are looking to impress your friends and family at mealtime with your carving skills this would be the perfect option. With it’s high quality blades you won’t keep your hungry dinner guests waiting. 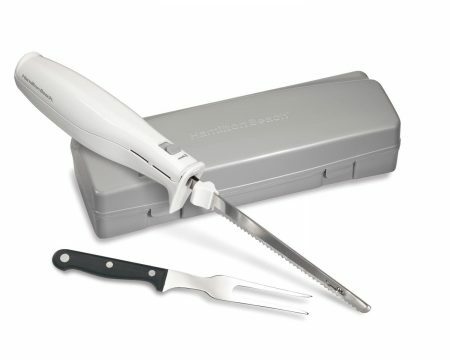 The Hamilton Beach electric knife makes cutting roasted poultry and joints of beef easy with it’s serrated blades that will cut effortlessly saving you time and effort. Including a stainless steel fork to allow you to serve your freshly sliced meat straight to your dinner plate. The handle is designed for comfort that gives you a better grip and more control while carving, but be aware that if you use it for extended periods it can get very hot to hold. Storing this electric carving knife away is easy since it comes with it’s own storage case that will hold the blade, knife and fork which will prolong their lifetime usage. This particular model we recommend because it has all the basics you could want for carving meat and bread slices at an affordable price. The Hamilton Beach electric knife is perfect for anyone who is on a budget, but would like to gain the benefit of faster carving times with more clean and precise cuts of meat without paying high amounts of money. This versatile electric carving knife will enable you to cut a variety of food items including meat, bread, cheese and even has craft uses for cutting foam for home DIY projects. It’s smaller size makes it comfortable to hold with it’s ergonomic grip which will increase control while slicing. 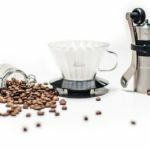 Including a lot of useful features it has a safety lock, dishwasher-safe parts, blade release button for easy cleaning and a knife stand for easy safe storage. This is a great affordable option that will be able to slice through anything with ease, while it isn’t the most expensive electric carving knife it doesn’t cut out on quality. It comes with a safety lock and a knife stand that will keep it upright and out of reach of children, however if somehow they do get a hold of it rest assured as it comes with a solid safety lock. 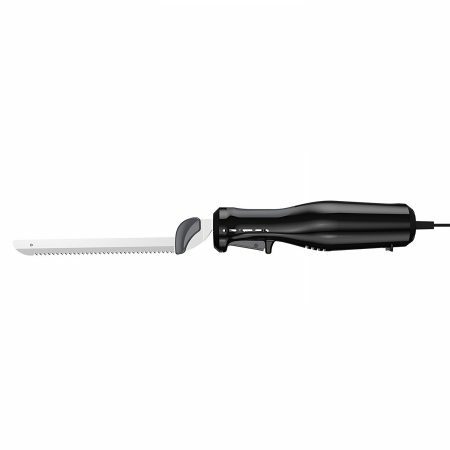 If you are looking for a more minimal electric carving knife this is the one for you. With it’s smaller price tag it will surprise you in what it can accomplish. With it’s 7.75″ carving blades it will slice through your meat and bread with precision. 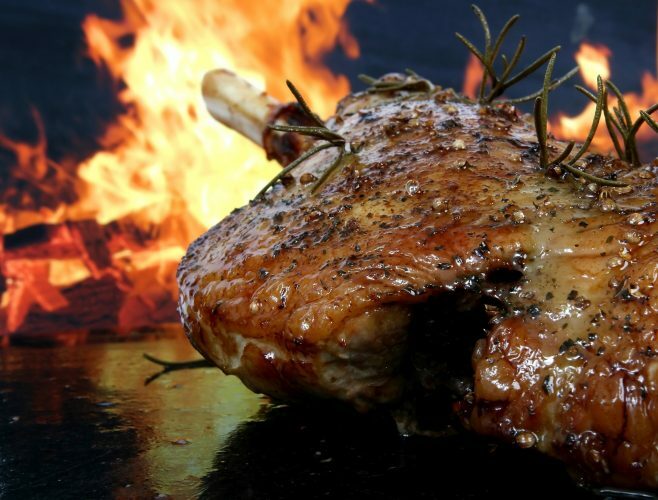 It is capable of slicing thin, medium and thick slices of meat and bread. Comes with a space-saving storage case that will safely store your blades and electric knife securely until the next use. 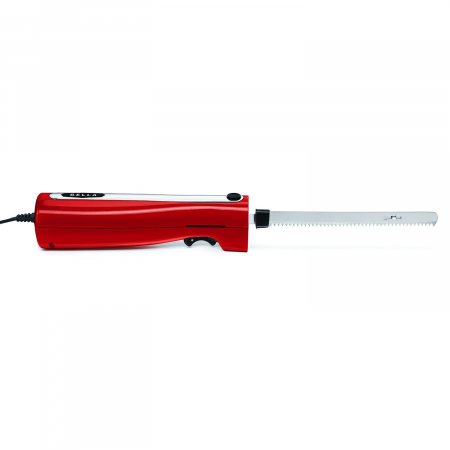 We recommend this electric carving knife as even though it’s small in size it doesn’t compromise in slicing ability. It will be able to make carving and cutting faster than doing it yourself manually. Including useful features such as the blade release, storage case and multiple blades. Plus the bread knife blade ensures you won’t get flattened bread with a large pile of crumbs. We hope you have enjoyed reading our guide to help you purchase the best electric carving knife for your kitchen. Electric carving knives make serving the best cuts of meat and perfectly proportioned bread slices quick and easy! If for any reason you didn’t seem to find one to suit your cutting and slicing needs, we recommend that you should check out Amazon’s best sellers list here. This will give you an even wider range of the best on the market.